Are you an athlete looking to stay in peak condition? Maybe you’re just passionate about exercising and staying fit? Either way, you can benefit from seeing a sports physician. Every sport and physical activity — from golf to football, running to weightlifting — puts your body through a great deal of wear and tear. By working with a sports physician, you can learn how to take care of your body and get ready for whatever your physical activity of choice is. 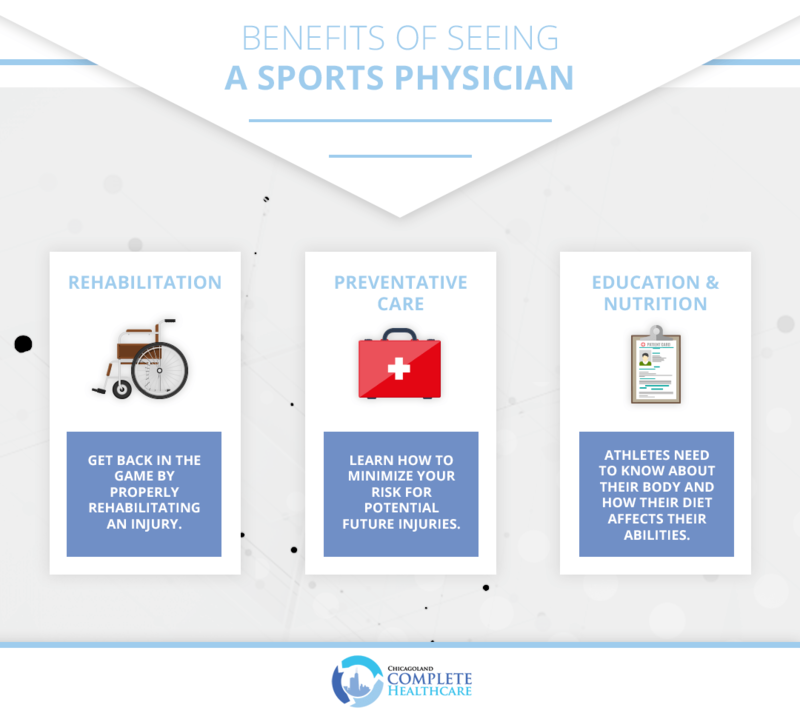 Today, we’ll be looking at just a few of the benefits you stand to gain from seeing a sports physician. If you would like to learn more, call Chicagoland Complete Healthcare to schedule an appointment. If you suffer some sort of injury while playing sports or exercising, it can be frustrating. You want to get back out there and you feel like you’re stagnating, waiting to heal. With rehabilitation from a sports physician, you’re able to undergo orthopedic surgery and physical therapy that will help speed the healing process along. Therapy includes injury specific stretches and exercises that will rebuild and strengthen the affected area. It can also include balance training, strength and conditioning, massage therapy, and more. Without providing the proper rehabilitating therapy, an injury will not heal in a way that allows you to perform to your fullest ability. That is because rehabilitation also helps restore and improve your flexibility and range of motion, which can be severely impacted by an injury or required surgery. Sports medicine goes beyond just rehabilitation of injuries. Preventative care is just as important to sports medicine as it is in other aspects of our health. A sports physician is able to teach you how to properly train your body and how you can minimize your risks of a potential injury in the future. This includes advising you of specific workouts that are good for your needs and goals, wellness treatments, exercises and stretches intended to strengthen the muscles you’ll be using the most for your specific activity, and more. Sports physicians look at the full picture when it comes to strengthening your body against possible injuries. In order to get the most out of your athletic endeavors, it’s vital you have a clear understanding of how your body works and how you should treat it to keep it in good condition. As such, sports physicians provide information regarding nutrition alongside their rehab and preventative care treatment. They will help you understand the impact of your diet on your performance and how to give your body the fuel it needs so you can get the results you’re looking for in a faster time frame. Additionally, sports physicians focus on the individual needs of someone to ensure their diet suits their chosen sport, athletic goals, and general health. For athletes of all experience and commitment levels, a sports physician can help you achieve your goals, stay healthy, and recover from injuries faster. If you are looking for a sports physician in Chicago, call Chicagoland Complete Healthcare to schedule an appointment today.